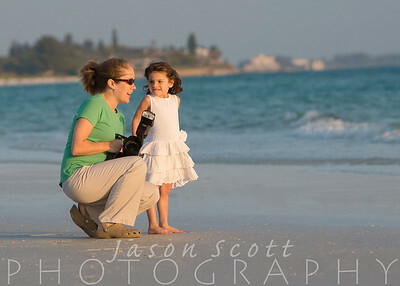 Looking for a photographer for family or engagement portraits on beautiful Siesta Key or another local area beach? Jason Scott Photography offers the best value, the most convenient booking and post-sitting access to your photos, lots experience, professionalism, and top-notch equipment. That's why we're the #1 Beach Portrait Photographer on Siesta Key! Will you be taking our beach portraits? Yes! We do not subcontract our beach portrait sittings. 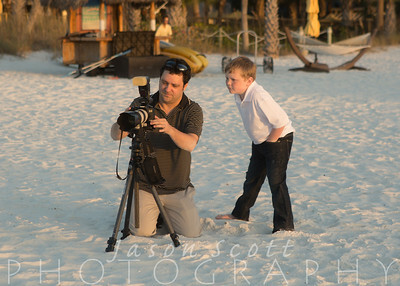 We (Jason and Allyson) will be the ones taking the photos at your beach portrait session. We only shoot one beach portrait per evening, so we can utilize the perfect light that occurs before and after the sun sets! Secure your date today! How long will our beach portrait session last? What time will our session start/end? We generally set aside about 40 minutes to one hour for a beach portrait session. We will arrange the time with you based on the sunset time on the day of your session and the number of people in your group. Lots of people ask us if we can shoot their photos at a different time. Our answer to this question is almost always "No." The light in the middle of the day (or even an hour before our usual start time) is simply terrible for photographing people. There will be hard shadows on everybody's faces. People will squint. Everyone will be hot. The photos just won't look right. Please trust us, 40 minutes before sunset is the perfect time for your photos! Photographers call this "the golden hour" for good reason! If you have small children with early bedtimes, we recommend a long nap, a nice meal or snack before your session, and a bribe (ice cream?) for kids old enough to appreciate bribes! Most kids do fine - your kids will probably surprise you! Click here to read more about summer sessions with small children! What should we wear for our beach portrait session? We recommend white tops and khaki bottoms (our favorite!) or white tops and denim bottoms. Other colors are OK as long as you stick with solids instead of patterns and keep the colors consistent throughout the group. Pastels are better than primary colors - pretty much any color you would see on the beach or in the sunset works well (light green, light blue, pink, pastel orange, yellow, etc) as long as you stick to one color scheme. More about what to wear. Where will you take our beach portraits? We have a few beautiful spots that we like to use for our beach portrait sittings, but we know it is easier for many people (especially large groups) if we come to you. If you are vacationing somewhere nearby (on the water) and you would like us to meet you there for your beach portraits, we are happy to accommodate you. However, keep in mind that we cannot control what is in the background (i.e. other buildings, lack of sea oats/grass, etc) if you choose to have us come to your location. When will we be able to see our beach portraits? What do we get for our $285? Why should I hire you instead of someone else? For your $285 investment, you receive 40 minutes to one hour of our time (depending on the size of your group), multiple poses, backdrops, and groupings, an online gallery, and professional retouching for any images over 5x7 that you order. We do not charge extra for additional families/people at your session. If you are having a family gathering with 20+ people and you want them all in the photo, we're happy to accommodate your large group! We know many customers would like to have the files from their beach portrait sitting. Good news! You can purchase a digital download of your entire gallery through our shopping cart after you receive your gallery link. Individual images are available for purchase as well. This includes the rights to print wherever you like! Unfortunately, we can't control the weather! (Boy, do we wish we could!) Booking your beach portrait sitting early in your visit is recommended so that we have flexibility to reschedule if the weather does not cooperate! Wind is actually a more common problem than rain. If we have to cancel due to bad weather and rescheduling is not possible, we will refund your money in full. If the weather changes mid-way through your session and we need to cut it short, we will make a decision to reschedule/refund or leave things as-is based on whether we feel we've taken enough photos to give you a good selection or not. We absolutely will not stay on the beach if there is lightning - our light stand is like a big lightning rod and we don't want to put you or ourselves at risk! Thank you for your understanding! Note: We do not consider the following conditions to be "bad weather" - too cloudy, too hot, too cold, too many people on the beach, bad weather earlier in the day. Canceling for any of these reasons would be considered a "non-emergency" (see below for more information). We will only cancel or reschedule for rain, high winds, or severe fog. What if I need to reschedule? What is your cancellation policy? If you want to reschedule at the last minute due to some other non-emergency reason (i.e. sunburn, someone had too much to drink, you forgot, you just decided you didn’t want photos, grouchy kids, etc), we will charge you an additional $100 fee to move your date. If your new date gets cancelled due to weather, we will refund the original $285, but not the additional $100. If you decide to cancel your original date due to one of these non-emergency reasons, or if we can’t reschedule and you have a non-emergency reason for wanting to move your date, we will keep your $285. We do this because reserving your original date means we can't book other people on that date. Thanks for understanding! We reserve the right to decide what is an "emergency" and what is a "non-emergency." We want to be kind and understanding, but we also need you to understand that when we save a date for you, we often turn away other customers for that same date, especially during our busiest months. Think of it this way: if you purchased plane tickets, or tickets to a show, or tickets to a sporting event, and then you could not attend for some reason, would they refund your money? We want you to be happy! If you are unhappy with your photos for any reason, we will schedule a reshoot if possible. The original photos will be removed from our site and the new ones will replace them. Will we have a signed contract guaranteeing our beach portrait sitting? We generally do not complete contracts for beach portrait sittings due to their short length and typically short notice for booking. We hope you'll consider our email communications a written contract of sorts so we can skip this step!